Display uses scientific notation, 10 digits mantissa, 2 digits exponent, red LED. Distinctive features: The first hand-held calculator with business and finance functions. Has functions for business and finance calculations, such as compound interest. 3.6v (3x AA rechargeable cells in a battery pack). 80 x 149 x 36 mm (3.2" x 5.9" x 1.4"). 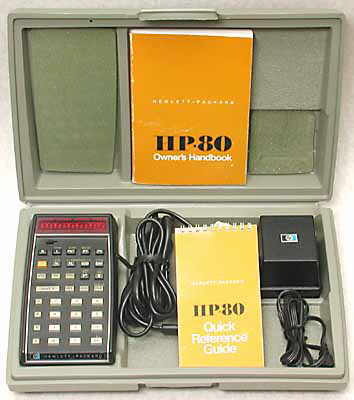 This was the first hand-held business & finance calculator and was the second Hewlett-Packard hand-held calculator. Like the early HP-35 models, the early HP-80 models do not have the model number on the front label. The early HP hand-held calculators were very expensive. Tough plastic cases were available to protect them. 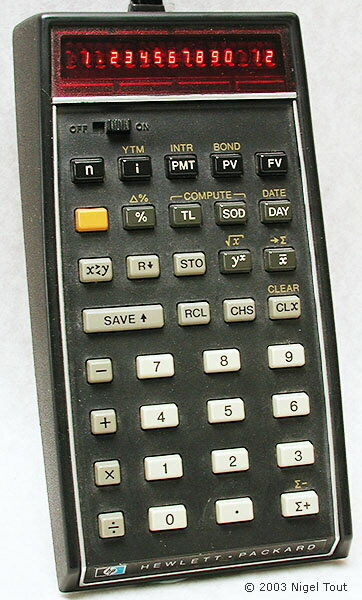 There is an enormous amount of information about the HP-80 gathered by David Hicks at the Museum of HP Calculators at http://www.hpmuseum.org/hp80.htm.